An art school that shows art on its website. Imagine that! 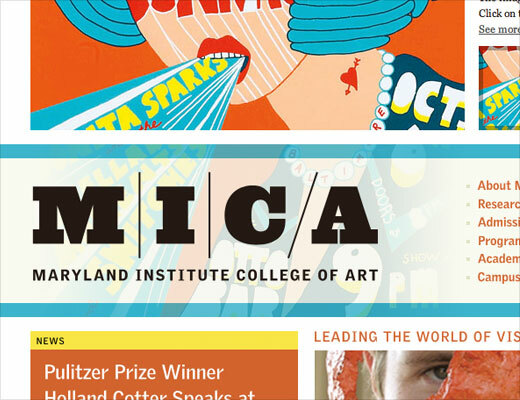 Working with Dan on the MICA website was a transformative experience for me. Dan opened my mind to solving front-end design challenges from a framework of design values as opposed to solving them by relying on expertise in a particular technology (XHTML, CSS, Flash, etc.). The dangers of stagnating in any of those waters is that you aren’t addressing the real problem, which is how the design supports and enhances the experience. At the end of the day, amazing things are possible with web standards, but those amazing things are created and discovered from a place of design thinking and creativity, and not inside a WC3 validator. Dan embodies this philosophy. To date, the Maryland Institue College of Art redesign has been one of my favorite projects ever. Here’s a look at some of the intricacies behind this new site. The initial concept behind this design is driven by leading with the artwork the school produces. More than the just a large element on the home page, the artwork does more than just take up a significant amount space; it acts as a filter that starts to permeate the site-wide experience. Choosing a piece from the home page changes the tone through the colors of just about everything on the site, from links to background colors. This choice followed you as you navigate to the sub-pages. Think of it as a subtle user-driven art-direction. Technically, this proved more challenging than you would think. For qualities like link and background colors, on-the-fly color switching is a piece of cake. Throw sIFR into the mix, dynamically generated colors chosen by administrators of an XML-based content management system, and the ability to do this not 1 but 4 times, and it’s a different ball game. Notice anything particular? That’s right; the background behind the logo is slightly transparent, allowing you to see through to the artwork behind it. That’s a cinch; we’ll cut the logo as a semi-transparent PNG file, and be done with it. To make life easy for site administrators—I can’t stress enough how much I resisted the urge to say “webmasters”—you’ll see that the borders are actually an inconspicuous Flash file. This file accepts a hex value and programatically draws the border with the correct transparency in the right spots. Because you can create Flash files with transparent backgrounds, some simple CSS positioning achieves the effect we’re looking for. Hope you enjoyed this insiders’ look!